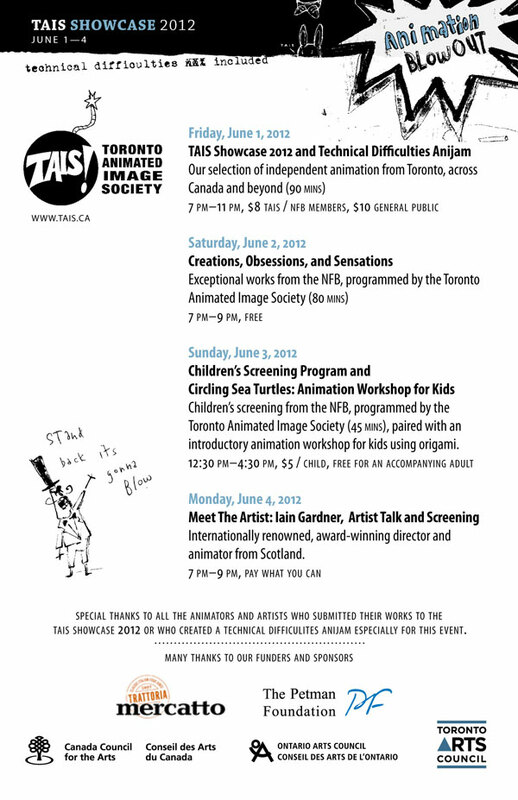 The Toronto Animated Image Society holds their annual screening event, the TAIS Showcase beginning tonight. The opening show will be TAIS Showcase 2012 and Anijam: Technical Difficulties, consisting of the best from Canadian and international animation. The screenings continue with Creations, obsessions, and sensations, a free show of National Film Board (NFB) works. On Sunday afternoon, they will host Children’s Screening Program & Animation Workshop for Kids which is $5 for kids and free for accompanying adults. The series closes with Meet the Artist: Iain Gardner – Artist Talk and Screening, a pay-what-you-can screening and talk by the Scottish filmmaker. Gardner is an animator, festival programmer and winner of Best Animated Short at the 2011 CFC Worldwide Short Film Festival. All events take place at the NFB Mediatheque, 150 John Street at Richmond.